Entries to all events are free unless otherwise indicated. Food and drink available for purchase on the night. Entries close Sat Dec 10 unless full before that date. Please contact the relevant person below to enter. Men's 100m - sub 11s. Please contact Dom Godfrey via email or mob 0401 624 070. Women's 200m - sub 27s. Please contact Dom Godfrey via email or mob 0401 624 070. Women's 1500m - sub 5 min 1500. Please contact Brett Coleman via email or mob 0438 434 260. Men's Mile - sub 4.10 1500m. Please contact Brett Coleman via email or mob 0438 434 260. 10k - sub 33min or form to do so. Please contact Brett Coleman via email or mob 0438 434 260. Pole Vault - Women 3.50m; Men 4.60m. Please contact Hamish Nelson via email. Junior 800 - fastest 16 Men & Women to apply. Please contact Darren Riviere via email or mob 0422 667 087. Primary School Sprints - simply turn up on the night. Media Enquiries to Dom Godfrey via email or mob 0401 624 070. Women to start at 3m, go up by 15cm till 3.45m then up by 10cm increments. Men to start at 3.90m, up by 20 till 4.70m then 4.85m, 5.00m then up by 10cm increments. 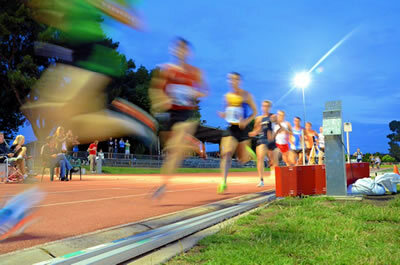 (If more than 1 Australian Record, prize money will be split equally). BONUS: $1000 for winner of mile if sub 4 mins. Steigen socks for ALL competitiors.